Safe to say you already have one or more utterly adorable, funny, sociable fluffy bunnies. You probably know a lot about rabbits as pets and you are knowledgeable about their care, eating habits and already have a cozy rabbit cage in your home. So you looked out of the window and into your garden and thought about providing your lovable rabbit with a safe, roomy and comfortable cage so that they can enjoy fresh air, the colors and the scents each breeze gently sways around? Good news for pet bunny parents: there are great outdoor hutches and cages readily available to accommodate your furry companions and bring even more life into your garden or yard without breaking the bank! If you are considering an outdoor villa for your bunny or thinking of getting your first rabbit but have no room in the home, bear in mind that there are some points to consider as regards outdoor cages or hutches. First off, you probably have more space outside, so that’s a huge plus. Another advantage of an outdoor home is that rabbits with a proper, well designed, roomy and cozy enclosure can live a more natural life: they can enjoy their favorite activities like hopping, digging, nosing around and nibbling in the fresh air and without damaging your furniture or chewing your cables. The obvious advantage of a traditional hutch and run cage solution is that bunnies have plenty of space for their healthy daily activities but also a cozy shelter when they feel stressed, tired or sleepy. As with most designs for cages, the bigger is always better, and if the materials are quality and the build is solid, the pets will be safe, happy and even more active as the outdoor cage brings them a few hoh3ps closer to their natural environment. Being pray animals, rabbits need to be protected from predators. Even if there is no danger around, bunnies need to feel safe so the retreat area is especially important. Ideally the hutch and run should be permanently connected although the run can be separate as long as rabbits have easy access to the run at all times. The only downside is actually from the owners point of you: being quite large they don’t provide the easiest access for handling, cleaning and feeding in the way the smaller indoor cages do. But, hey, we’re trying to make our fluffy friends happy, so some sacrifice on our part is unavoidable but will certainly be appreciated. Quality wood is a must for durability and to stand up to weather. Another important feature is mesh or rabbit-friendly wire construction to keep them safe and let the air in and the door which has to be safe enough to keep the nosy pets from getting out. Galvanized steel construction is often used for huge coop-like cages if you intend to keep more rabbits than just a couple. In a nutshell, look for the best match to rabbits’ needs: a safe enclosed sleeping area and a large, open but equally safe exercise space. Also, consider a cage or hutch design which will nicely fit in your yard or garden. Quality material and solid construction are equally important as well as features such as ramps which connect the sleeping and playing parts of the cage and a good roof over little ones’ heads. Once you find a perfect balance of security and freedom for your furry friends and aesthetic appeal for you, go for it! 20x10 ft walk in cage by ChickenCoopOutlet is a huge sanctuary, shelter or playground for your rabbits and other small animals. Made of high quality, steel galvanized frames, this cage is designed to last for years on end providing both safety for the pets and a peace of mind as regards their welfare for you. Almost fully open, this walk in pen and cage features a large UV stabilized shade sail which provides the much needed shade on hot days. The strong 1x1 inch, 19 gauge thick PVC coated hexagonal wire mesh will do the job of protecting the animal from the sun’s rays. 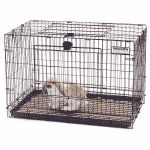 This cage has impressive 200 square feet area for you to use whichever way you see fit. You can furnish it with hutches, smaller cages, and separate play spaces or even divide the cage into smaller sections for different purposes. In order to make your pets as comfortable as possible and to make the best use of such large space a number of housing alternatives within the cage are possible depending how many rabbits or other small pets you intend to keep there. One fact is certain, the high quality and sturdy structure will keep predators at bay and completely rust resistant galvanized steel tubing will stand up to elements. Another highly useful feature is the large full-size door which provides easy access for feeding and maintenance purposes. We do need to mention that this cage comes with item comes flat packed. The assembly will indeed require more than one person but it shouldn’t be too complicated as long as you have some DIY experience and a basic set of tools. TRIXIE Rabbit Hutch with a View features a beautiful design with unique roof lines and upstairs window as a charming addition to your garden. The spacious two-story design has a retreat area on the upper level for your pets to feel safe and rest or sleep peacefully. This unit also has an attic with removable floor. The attic area can be used for storage and also provides additional insulation. It has a hatch and sliding door to give you the option to restrict access between levels if needed. The non-slip ramp allows your furry pets to easily hop between the levels and enjoy the cozy retreat or play in the spacious area downstairs while enjoying the fresh air and a more natural environment. To make this shelter even more functional and cozy, there is a window pane and wood paneling at the back. They provide additional protection from the wind and rain. For easy maintenance, the manufacturer has included a pull-out plastic tray and a hinged roof with two locking arms that can be opened on each side. Assembly required but all the hardware is included so all you need is some free time, a pair of helping hands, perhaps, and a little patience. 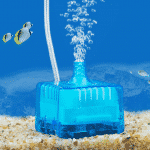 You will need to add feeding and watering accessories as they are not included. After that, all your bunnies will need are regular supply of hay and water since they have a cozy home which will also protect them from cats, dogs or other animals you might have around. TRIXIE Pet Products Rabbit Hutch will be the perfect home for one or two bunnies with enough space and levels to hop around. The upper level gives them some off the ground place to bed down while keeping them hidden from any night predators. The solid wood construction with glazed pine finish and quality materials make this hutch sure to last for a long time and hold nicely in bad weather. It will need very little maintenance but your pets will appreciate regular cleaning and bedding replacement. The two-story design includes a retreat area on the upper level and play space on the ground level. The non-slip ramp allows your pets to snoop inside and outside, upstairs and downstairs, in the sun or in the shade to their hearts’ content. This hutch has an attic area for storing extra bedding or necessary bits and pieces. In cold weather, the attic will provide additional insulation for the sleeping area. There is a sliding door to the ramp so you can close your pets up top in evening to keep them safe and warm. The hutch can be assembled very easily in less than an hour. TRIXIE Pet Products Rabbit Hutch is well made, sturdy and the bar spacing is perfect, to keep the bunnies secured, even when there are babies inside. The wood and finish of this unit perfectly blend in any area of your garden and make it even prettier while the happy tenants draw the much deserved attention from your family and friends. Pagoda Rabbit Hutch comes with the dimensions suitable for up to 3 rabbits (L: 45.75" x W: 45.75" x H: 42.25"). It has 2 levels with the play area on the ground and the shelter above it. This comfortable bunny home is sheltered by a roof made of asphalt which non-toxic and waterproof. Guaranteeing good insulation, it will keep your pets cool in the summer and warm in winter. The whole hutch is made of premium and rot resistant cypress fir lumber grown in government controlled, sustainable forests so you can be proud of this eco-friendly unit. On top of that, the hutch looks really cute and will be a lovely addition to your garden or yard. The hardware used including the fences, hinges and latches are made from galvanized steel so you won’t need to worry about corrosion. If you are considering a rabbit home which will last a lifetime, well made and spacious enough to provide everything your precious little bun needs, this might be a unit for you. Make sure you keep living, exercise and sleeping areas of this rabbit hutch clean and provide and replace bedding regularly. There are to access doors and one ramp which allows rabbits to go down into the outdoor space to play while being safely enclosed with rabbit-friendly wire. The cozy indoor sleeping box on the upper level has a pull-out tray for easy cleaning and maintenance. In addition to a comfortable and private nesting box, your pet will have the convenience of enjoying the lovely weather and fresh air while feeling safe and you will enjoy seeing your rabbit happy. It is designed much as a wooden house with sloping roof and a retreat area in the upper floor. There is also an attic for storage with a removable door. There is a standard non-slip ramp which the rabbits can use to move up and down and a hatch door that to restrict free access between the two levels. There are two trays for easy cleaning of the hutch. Another convenient feature is the hinged roof which has locking arms opening on either side. This hutch is nicely designed with plenty of doors along the sides and sloping roofs so that the rain and snow will not bother the little furry snoops. 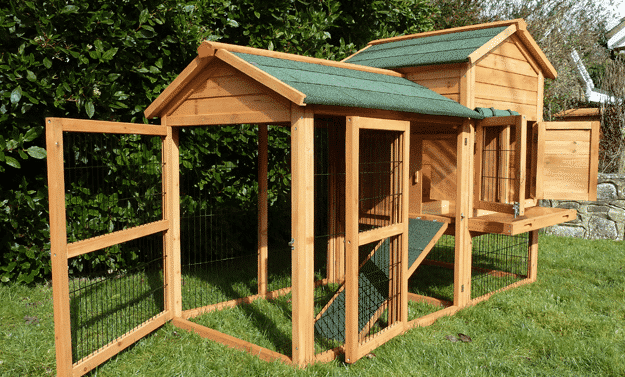 The dimensions of 53 x 44 x 45.2 inches can house larger bunnies and with the additional safety features there is enough space for play in a safe environment. Your bunnies can easily move up or down whenever they feel like interacting with the outside world through the wired walls. The duplex shelter upstairs will give them a safe place to rest and the shade in hot weather. It is easy to install the hutch since the pieces come neatly packed and are easy to put together. The instruction manual explains all the steps clearly and you won’t have any problems there. Two people will assemble it easier, though. You will certainly appreciate the feature of two separate trays to make cleaning easier, and make access to your pets much easier with convenient doors all around.